While the work on this magnificent 'destination' garden in Palos Verdes is still going on (additional hardscape, decorative gravel, fountain, container gardens, etc. still to come) I wanted to post a series of images to convey just a bit of how this lovely and wonderfully articulated landscape is being 'transformed'. The owners wanted a cactus & succulent garden that would be visually stimulating all year round - something that would be as inviting as the amazing view they have from their home which looks out and across the valley below. They also wanted the garden to be a 'destination' that could be both intimate and reflective while maintaining an expressive colorful, open and inviting space to entertain in - a place to gather and enjoy friends and family. This is it! Before - the garden's central area 2nd level - soon the work will begin, new soil, ledger stone, etc. Early on - mid garden level - some soil having been installed at this point, and all areas prepped for planting, boulders, and ledger stone. Soil, ledger stone, far wall being redesigned - central garden lower level. An early shot of side walk way...the area has been cleaned and soil leveled. Look for the 'after' photo of this walk way area. An early shot of the garden levels...new soil, boulders, ledger stone, a few Golden Barrels...more on their way. Work in progress - garden's central lower level. Love the colors and the dramatic sculptural shapes. The guys...planting in the blue garden area. View of work in progress - both the 2nd and 3rd garden levels. These guys truly know what they're doing...every step of the way. A Palos Verdes tree - fits perfectly into this corner of the garden - in the hills of P.V. Remember the 'before' photo of this side walk way? It has been transformed from a kind of 'lost space' to a working area of the garden that is the connecting loop to the garden's pathways. A long view of the garden coming to life...a beautiful work in progress. I adore the Fan Aloe, this one happens to be a very old and magnificent plant. Planted in the right spot, it casts fabulous shadows throughout the day. 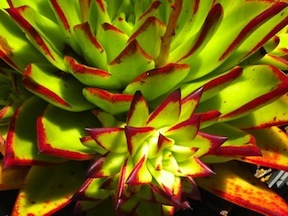 In the spring it will bloom bright red flowers on stems that dance above the aloe leaves. Hard to imagine this garden without this particular plant.